Brie Larson is back on the promo trail for 'Avengers: Endgame' and earlier today(April 15th) Seoul, Korea, she attended a press conference for the event. Her stylist Samantha McMillen posted her look to instagram. 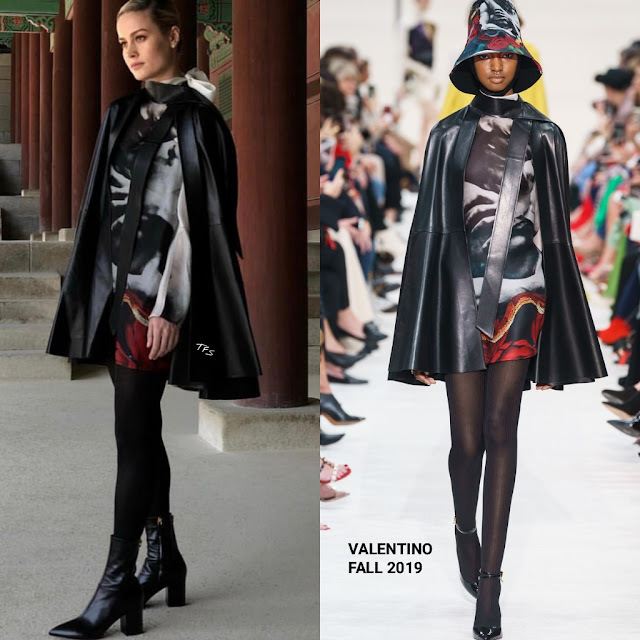 She posed for the gram in a VALENTINO FALL 2019 black leather, tie neck cape and a printed mini dress underneath. Her dress was styled with WOLFORD tights and black leather ankle boots. Seeing as this is a superhero film, Brie's cape ensemble was perfect for the press conference. She finished up with a complimentary beauty look, EF COLLECTION earrings and DANA REBECCA DESIGNS studs. What do you think of Brie's instagram style?